The Campbell Hausfeld Dessicant Air Cleaner / Dryer is designed to remove dirt, most contaminants, oil vapors and water from compressed air. It is a two part system consisting of a coalescing filter which removes most contaminants, oil vapors and condensed water and a desiccant dryer which removes water vapor. Dessicant changes color when it needs to be changed or recharged. The outlet screen keeps dessicant particles out of tools. 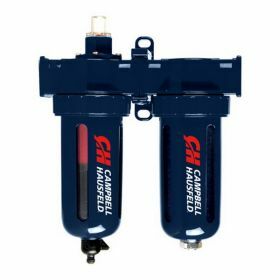 Oil-removal filter removes 99.9 percent of all oil aerosols. It has a clear bowl with metal guards and a quick release bowl. 3/8" NPT ports.